Virgen de San Rafael waterfall area, on wall rock outcroppings alongside river (GPS: 18.01929N 071.08445W - 415 feet (127 meters) above sea level), Barahona District, SW Dominican Republic, July 29, 2010. Helix strumosa was introduced to the scientific world in a paper read by (the preposition"for" is more likely) Louis Pfeiffer to the Zoological Society of London on March 9, 1852. The next year he published the name and a rigorous description in his masterwork Monographiae heliceorum .... (L. Pfeiffer, 1853: 243-244; species 1429). At first reading, these two citations appear to index publications that antedate this 1853 description of H. strumosa, but evidence indicates that this was not the case at all. Although the paper Pfeiffer read was published in the "Proceedings of the Zoological Society 1852" (Zoological Society of London 1863: 44, 183), later bibliographic research placed the actual date for the publication of the paper at July 27, 1854 (Pilsbry, 1933; Duncan, 1937), which clearly is after the Monographiae heliceorum description, i.e, L. Pfeiffer (1853) vs. L. Pfeiffer (1854a). Element (2) of this chresonymy refers to the second, or "Küster" edition of the Conchylien-Cabinet, a monograph initiated by Martini and Chemnitz, who were the principal contributors of twelve volumes appearing from 1769 to 1829. The second edition, initially under the editorship of H.C. Küster, was intended to account systematically and illustrate every known mollusk. 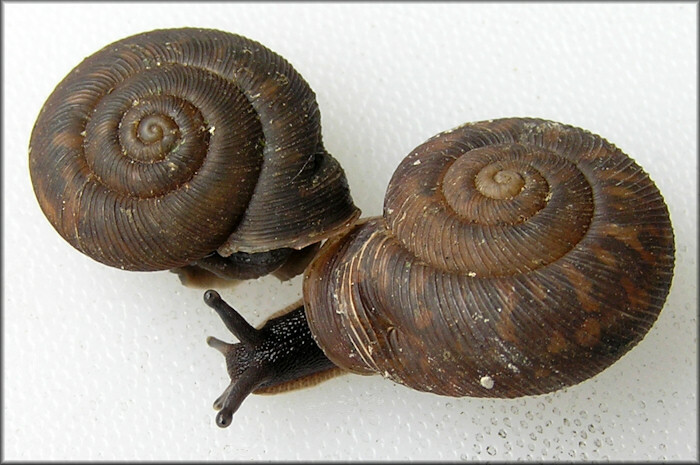 The work was released in 584 issues (Lieferungen) with taxonomic groups published intermittently and in almost haphazard sequence, comprised over 100 volumes, and treated nearly 4400 molluscan species, and ran from 1837 to 1920. To say that the work is a bibliographers nightmare is hardly doing justice to this byzantine but indispensable work. Fortunately for malacologists, Francisco Welter-Schultes (1999) has provided an extensive collation of this work. This allows proper dating of the treatment of H. strumosa in the Conchylien-Cabinet, and it was in 1854 (Welter-Schultes, 1999: 162), i.e. Pfeiffer (1854b)! Since Pfeiffer was able to cite pagination and the plate/figures, it appears that he somehow had access to the Küster production, which had reached galley proof or some stage approximating that level of prepublication format. Such occurrences may not have been unusual in the expansive and convoluted production as the second edition of "Chemnitz." Thus Helix strumosa Pfeiffer, 1853 antedated the publication of the two citations (Pfeiffer, 1854a, 1854b) included in its description. Well, that's now comprehensible. End of story? Not yet. In Pfeiffer (1854b: 478; sp. no. 1073), between the Latin and German descriptions, are three citations: (1) "Helix strumosa, Pfr. in Proc. Zool. Soc. 1852." (2) "Mon. III p, 243. N. 1429." and (3) "[Helix strumosa] Reeve Conch Icon. N. 763, t 127." The first two are familiar while the third warrants explanation. Reeve (1852: species 763; pl. 127, fig. 763) [see page two] treated Helix strumosa with a slightly different Latin description, but there can be no mistaking it for the topical "Pfeiffer" species when one considers the text of the description (also in English) and the fact that he attributed the name to Pfeiffer while citing "Proc. Zool. Soc. 1852." It is very likely that Reeve was in the audience on March 9 of that year, and he certainly was in correspondence with Pfeiffer. The date of Reeve's publication is printed at the bottom of the page: "August, 1852," and full reliance has been afforded such indications by Petit (2007: 68). This clearly antedates Pfeiffer (1853) and establishes Reeve as the (first) author of Helix strumosa rather than the Pfeiffer attribution(s) uniformly applied by subsequent authors until now. As best I can tell, this is the first time this determination has been made. I wish to thank Richard I. Johnson and Dr. G. Thomas Watters for providing lively discussion and relevant literature. Petit, R.E., 2007. Lovell Augustus Reeve (1814-1865): malacological author and publisher. Zootaxa 1648: 1-120. Nov. 28. Pfeiffer, L., "1852" [1854a, 27 June; see Duncan]. 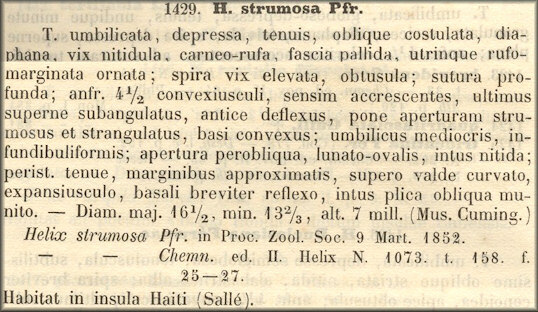 Descriptions of twenty-four species of land shells collected by M. Sallé on the island of Santo Domingo, from Mr. Cuming's collection. Proceedings of the Zoological Society of London 1852 20: 138-143 + plate 13. 27 June. See also Zoological Society of London, 1863. Pfeiffer, L., 1854b. Die Schnirkelschnecken nebst den zunächst verwandten Gattungen. Dritter Theil. Systematisches Conchylien-Cabinet von Martini und Chemnitz 1 (12) [(3)]: 291-524, plates 125-161. Pilsbry, H. A., 1933. Santo Domingo land mollusks collected by Samuel C. Pease, 1932, and by A. A. Olsson, 1916. Proceedings of the Academy of Natural Sciences 85: 121-162, figs 1-2, plates 6-11. Welter-Schultes, F. W., 1999. Systematisches Conchylien-Cabinet von Martini und Chemnitz (1837-1920), bibliography of the volumes in Göttingen. Archives of Natural History 26(2): 157-203.